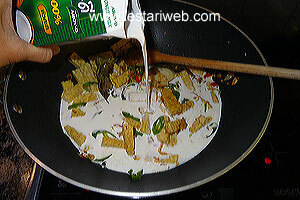 Tipps: The seasoning spices should be stir-fried until well cooked before adding the coconut milk. This is the secret to obtain the best taste. If you dont mind the smell of petai or stinky beans, then try to get them on the recipe. I assure you, Petai gives an exotic flavour to the sauce!! hmmmm......Yummy!! ;-) Unfortunatelly I didn't have stock when I was happened to pepare this recipe, so this time the stinky beans was absent. But it still taste good though ;-). 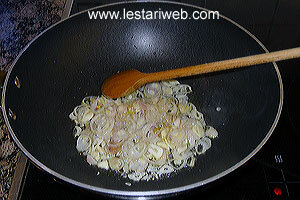 Heat 5 tbsp oil in a shallow pan/wok & stir fry shallot & garlic until transparent & fragant. 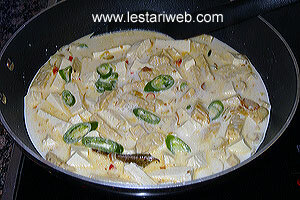 Add the chillies, salam/bay leaves & galangale. Stir all the time until wilted. (Add salt immediately if the chili's fumes causes you to cough uncontrollably ;-). 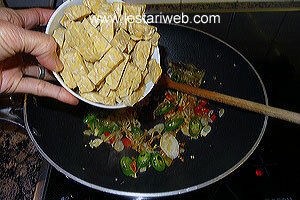 Add the sliced tempe and petai beans (if used). 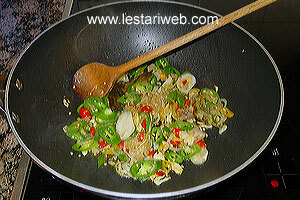 Stir fry for about 5 minutes until the tempe colour slightly changes & petai beans become a bit wilted. 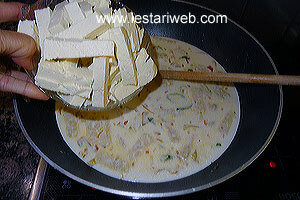 ** Add the coconut milk and stir to mix. 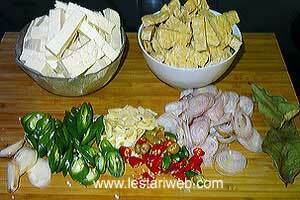 Add the sliced tofu. Bring over medium heat to boil. Stir occasionally. 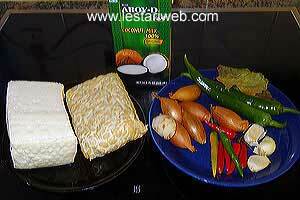 Note: ** If you use mix coconut milk (water & thick coconut milk), add hot water to the pan/wok at first then following by thick coconut milk & stir to mix immediately.